The Voice Amplifier MiNi uses an 8 watt speaker to provide the loud, clear output required for high quality voice amplification. In addition, it has a LINE input jack that can be connected to the output of a Speech Generating Device (SGD) for adequate sound levels in noisy environments. Use the belt clip to attach the Voice Amplifier MiNi to a belt, pants, skirt, etc. or use the supplied adjustable neckstrap. 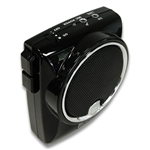 The Voice Amplifier MiNi has a Lithium-ion rechargeable battery that provides up to 15 hours of operation from a fully charged battery. Included in the box is a lithium battery which is pre-installed. Adjustable neck strap, leather amplifier case, nylon amplifier tote, plastic belt clip, International travel bag and charger, HM 200 headset Microphone. The Amplio is designed primarily to be work suspended around your neck. The model 6 is a void speech amplifier. The loud speaker designs is known for its extraordinary performance for its size and weight. For comfort and convenience, the model 6 has developed a unique tension/suspension waist belt that doubles as a shoulder belt for the amplifier or its durable 'bowling bag' style tote. Model 6 is ideal for use out doors or in a noisy environment. The operating time for this model is 8-10 hours. Amplified, 12-watt speaker with high performance headset microphone to amplify speech or a communication aid. The Voice Amplifier uses a 12 watt speaker to provide the loud, clear output required for high quality voice amplification. In addition, it has a LINE input jack that can be connected to the output of a Speech Generating Device (SGD) for adequate sound levels in noisy environments. Use the built-in clip to attach the Voice Amplifier to a belt, trousers, skirt, etc. or use the supplied adjustable fabric belt. The Voice Amplifier has a high capacity rechargeable battery that provides up to 20 hours of operation from a fully charged battery. This small, loud amplifier comes with a high performance headset microphone, a high performance lapel microphone, or both. The new Zavox Reo is a personal voice amplifier designed to reduce vocal strain and amplify the softest voice. It has been developed especially for clients who have Parkinson’s or a condition that makes speaking loudly difficult.